Greece’s central bank is working on a deal to securitise up to 42 billion euros of lenders’ bad debts. The plan uses tax credits from the over-indebted sovereign to help banks shift loans without too much pain. That will require a loose interpretation of EU state-aid rules. A government deal with creditors should lower funding costs for Greece’s big four lenders. With bad loans accounting for 48 percent of lending, normality remains a way off. But ending shareholder angst over debt sustainability could be the first step in banks’ rehabilitation. Northern League leader Matteo Salvini has reiterated his opposition to the single currency. Growing Italian discontent with the EU could make an anti-euro stance a vote-winner in upcoming elections. Despite Europe’s economic revival, monetary union remains a political target. Alexis Tsipras is desperate to avoid surveillance of his actions by the country’s creditors when its third bailout ends next August. The best the Greek prime minister can hope for is to move from a high-security unit to an open prison – and only if he behaves. Athens wants to issue bonds just after receiving another bailout tranche. If Greece had to finance itself at market rates it would struggle to stay solvent. But debt relief from European governments and ECB bond-buying will reduce the risk. Investors may find the wager appealing. Full view will be published shortly. The deadly fire in London’s Grenfell Tower has exposed the UK’s deeply flawed approach to housing. But serious policy flaws aren’t exclusively British. Americans fail in healthcare and Greeks won’t pay taxes. The only cure is a values revolution. Euro zone governments have rewarded Greek reforms and austerity with 8.5 bln euros of loans and promises of future relief. Political factors, including German elections, mean losses must remain vague. 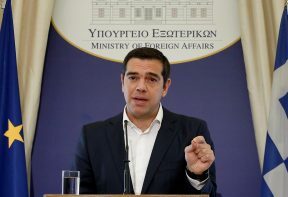 The lack of clear debt restructuring denies Greece the boost it needs. Linking national debt payments to economic performance could help countries cope with downturns. There are many obstacles. Bad governments might fiddle statistics; good ones may be reluctant to pay a premium for flexibility. Even so, the euro zone is a good place to test the idea. Both the U.S. territory and the euro zone laggard have fine beaches, irresponsible governments and a debt crisis. The most just and helpful response to such debacles is to force reckless lenders to write off loans. That’s a hard sell. Thankfully, few sovereigns are so careless. Athens has pledged to cut pensions and raise taxes, and could soon be eligible for European Central Bank bond purchases. That would push up prices just as other euro zone bonds start going the other way. Europe could drag its heels, but the likelihood of a messy default is low. France is about to choose a new president. The UK has called a surprise election. Germans head to the polls soon and Italians and Greeks could be close behind. As Brexit gets in motion and President Trump settles in, Europe’s election season will bring risks and opportunities. Despite a last-minute wrangle over pensions, Greece is likely to get the next chunk of the money due under its current bailout plan. But this will only buy Athens time until the middle of 2018. After that, a new programme, and more fraught negotiations, will probably be needed. Two members of the central bank's executive board have mused on its accountability, after a report criticised the ECB for overreach. It indeed pulled some pretty off-piste moves during the euro zone crisis. Yet clarity could constrain its ability to fight future crises. The government, its European creditors and the IMF are all being unreasonable in their own way over a bailout needed by July. The most sensible option would be for the IMF to withdraw. More likely is that if a compromise can't be found, the ruling Syriza party calls an election. Bond yields are rising as the end of money-printing looms. The return of a crisis like the one that prompted ECB President Mario Draghi's pledge to save the euro zone is unlikely. Yet as investors focus on political risk and debt, governments will face tougher choices.